Commercial landings of grouper in the US is dominated by the Gulf of Mexico, with Gulf of Mexico red grouper landings accounting for more than 50% of combined landings for the seven species assessed. In the South Atlantic (US EEZ in North Carolina, South Carolina, Georgia, and east Florida to Key West), gag is the predominant species. Total combined landings have slowly reduced over the last 30 years, from 6000 in 1986, to under 4000 t in 2013. All landings stay in the US. Black grouper, red grouper, yellowedge grouper, Warsaw grouper, snowy grouper, scamp and gag are all Not Recommended for both set longlines and vertical lines, due primarily to impacts on other species. Stock of black grouper, red grouper, yellowedge grouper (only in Gulf of Mexico), gag is not considered to be overfished, and it is unlikely overfishing is occurring. 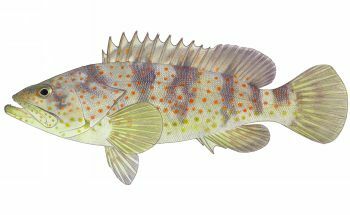 However, for Warsaw grouper, snowy grouper, yellowedge grouper (South Atlantic US), stocks are considered depleted and likely to be undergoing overfishing. Bycatch is a significant concern, with impacts on a variety of vulnerable and endangered species from both gear types. Management of the grouper fisheries is considered moderately effective, but the lack of formal stock assessment of several species. Vertical lines have no habitat impacts, while closed areas and gear restrictions reduce seafloor impacts for set longlines. Policies to protect groupers’ role in the ecosystem are in place. Black grouper caught by vertical lines in South Atlantic and Gulf of Mexico are now Not Recommended due to increased concerns over bycatch. In particular, red snapper, red grouper and hogfish are a high concern. Stock of black grouper not considered to be overfished, and it is unlikely overfishing is occurring. Management of the grouper fisheries is considered moderately effective, but the lack of formal stock assessment of several species. Vertical lines have no habitat impacts, while closed areas and gear restrictions reduce seafloor impacts for set longlines. Policies to protect groupers’ role in the ecosystem are in place. The Mexican bottom longline fishery targets black and red grouper off the Campeche Bank in the Gulf of Mexico. It is a small scale fishery that mostly supplies the local market. Red and Black grouper are listed as Near Threatened by the International Union for the Conservation of Nature (IUCN) and recent assessments indicate that the stock is overfished. There are also challenges due to the multi-species nature of the fishery, meaning that species of concern such as mutton snapper, warsaw grouper, and sea turtles are captured. Although a new management plan was introduced for this fishery in 2014, most of the regulations have yet to be implemented.